This Bundt cake did NOT want to happen. What Bundt cake am I talking about? The one I made for June #BundtaMonth in which our theme was Swirly June. 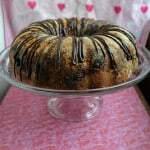 We had to create a beautiful Bundt cake with a swirl in it. I immediately picked out a pink lemonade swirl cake. When I went to the market to get the pink lemonade flavor they were out of it so I had to make a decision on the fly and went with cherry vanilla flavor instead. 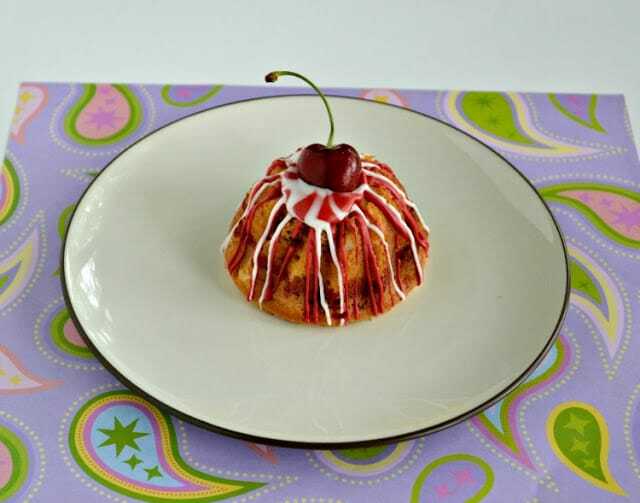 When I got home I prepared the batters happy with the decision to go with the cherry vanilla Bundt and already picturing how to decorate it. I preheated the oven, divided my batters, and went for my Bundt pan. It wasn’t there. I’m not kidding. My Bundt pan was not in my baking cabinet. So I started searching all over the kitchen, in every cabinet we have a still no pan. I then went to the dining room and searched every drawer in there. No go. I got my husband involved and we searched the entire house. Still no pan. By this time I was seriously irritated and ready to pour the batter down the sink. I knew I moved it into our new house because I used it last month. Then I remembered I had a mini Bundt cake pan. I got it out, carefully poured in my batters, and swirled it together. It’s much more difficult getting a swirl in a mini pan then a regular one but I didn’t have much of a choice. 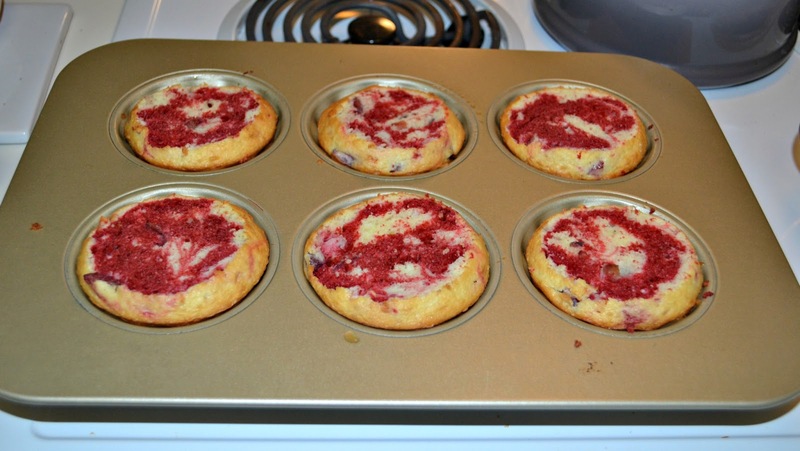 The cakes ended up getting really large and started looking like cupcakes in the pan. I removed them from the oven, trimmed off the bottoms, and put them back in. Finally the cakes came out and (thankfully) they came right out of the pans. The turned out cute and I loved the red stripe through the middle of the white cake. When I cut the cakes in half there was a small swirl in them, though not as much of one as I hoped. 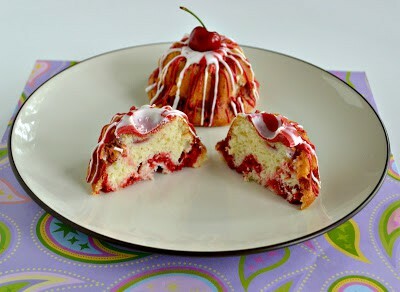 I ended up drizzling the cakes with red and white chocolate and topping them off with a cherry. They looked really pretty and tasted great. So while it was a disaster making them, they turned out all right in the end. 2. In a large bowl beat the butter, applesauce, sugar, and brown sugar with a mixer until smooth. Add in the eggs one at a time, beating after each addition. Stir in the vanilla. 3. In a medium bowl combine the flour, baking powder, baking soda, and salt. Mix well. 4. Add half the flour mixture to the butter mixture and mix well. Stir in half the milk and mix until it is combined. Add in half of the remaining flour and the remaining milk. Finish by stirring in the remaining flour. 5. Remove 1 cup of the batter from the bowl. 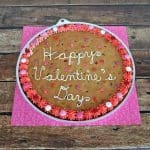 Add the Duncan Hines Cherry Vanilla packet and mix well. Set aside. 6. Gently stir the chopped cherries into the vanilla batter. 7. Spray a mini Bundt pan with cooking spray. 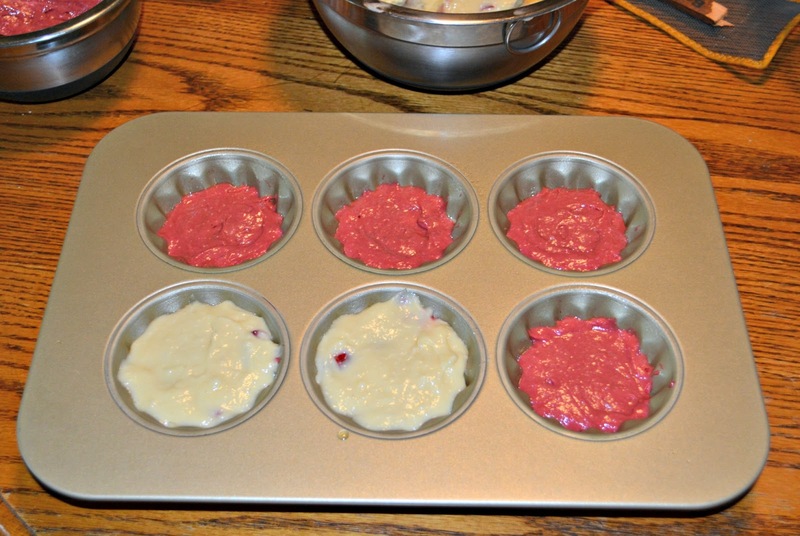 Spoon 2 tablespoons of vanilla batter into the pans then gently spread 1 tablespoon of cherry batter on top. Finish by spooning 1 tablespoon of vanilla batter on top. Using a knife swirl the batter together. 8 . Bake the cakes for 25 minutes or until the bottoms are browned. Remove from the oven and place on a wire rack for 5 minutes. Turn upside down and remove the cakes from the pan. Cool completely on a wire rack. 9. Heat the red chocolate in the microwave in 30 seconds intervals, checking until it is melted. Repeat with the white chocolate. Spoon each chocolate into a small zip top bag and snip off the end. 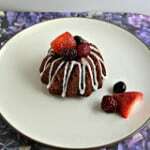 Drizzle the colored chocolates over the mini Bundt cakes. Top with a Bing cherry. We have a swirly theme this month for #bundt-a-month. 16 gorgeous swirly cakes in every form will be inspiration enough for you to bake with us this month. Want more Bundt fun? 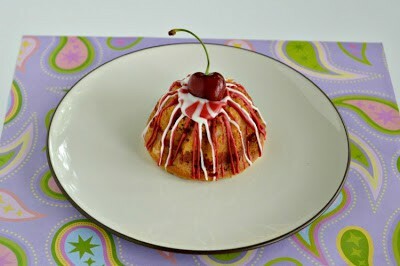 Follow Bundt-a-Month on Facebook where we feature all our gorgeous bundt cakes. Or head over to our Pinterest board for inspiration and choose from hundreds of Bundt cake recipes. These are adorable! Love cherries and vanilla together. Perfect summer flavors!! These are so very cute, love them!! Cherries and vanilla go so well together. 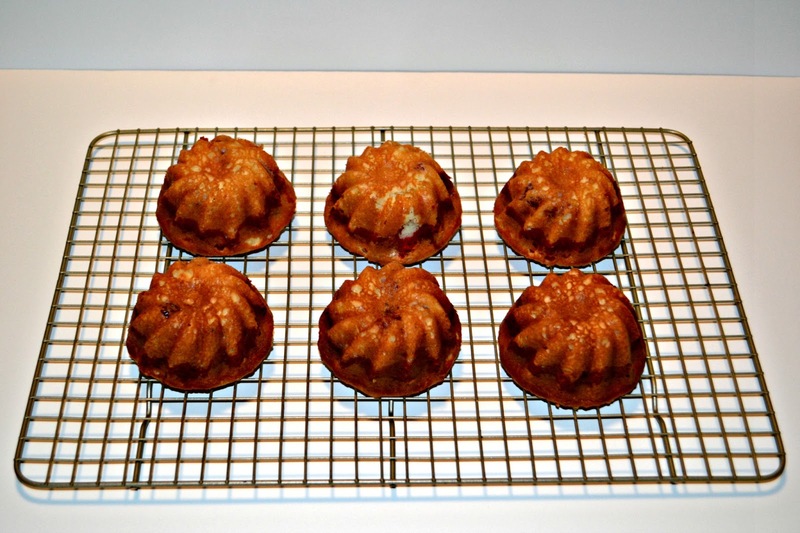 I think these cakes turned out great in the mini bundt pans – way cuter than a big bundt! Your little Bundts are adorable, Heather! I had the same problem with a missing muffin pan once and finally located in the storage area under my new oven. I hope you find your pan! Your mini vanilla cherry Bundts are cuties! Great idea to add the Flavor Creations packet to the batter, Heather. Great choice on the cherry and vanilla, sounds perfect for summer desserts. Did you ever find your pan? Hope so!! It may not have gone according to plan, but they look quite adorable. Did you ever find that bundt pan? I love how you’ve decorated your mini bundts, their so pretty. Glad you found your bundt tin.